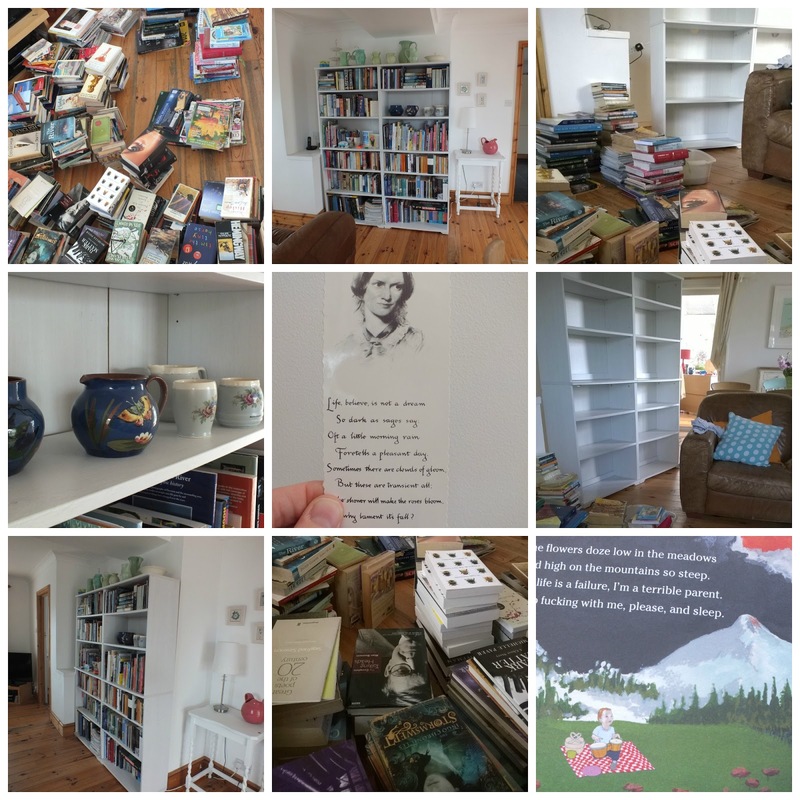 This week I decided to Spring Clean the bookcase in the living room. There was an ulterior motive. I suffer from restless furniture syndrome; the desire to change around one's living space every so often. I'm much better than I was. Gone are the days that Marc would come home from work to find the hall, stairs and landing carpet ripped up and thrown out the back door. But I am still often to be found hauling various items of furniture around the house. I used to constantly change my bedroom around when I was young. Did you? I have often wondered why I was always re-arranging. I constantly faff about (which I've talked about at length before). I like to make my home feel and look good, although to be honest my home is already quite lovely. Don't get me wrong, it's not a show home by any stretch of the imagination. Five people in a medium sized living space will make a mess and a clutter. A lot of our furniture has seen better days. One of the sofas has three tears in the leather. I'm holding out until Olly is older before I buy new ones (John Lewis, charcoal grey, fabric). There are broken drawers which have been wedged back in place on a wing and a prayer. My own chest of drawers in my bedroom is rather tatty. It's a very old IKEA unit that has been painted multiple times. The bottom drawer has lost its' handles, something I mean to remedy every time I open it to take out clean bed linen. I took the books off of the selves and line them up on the floor. There are a lot, and most of them were very dusty. So they are given a thorough clean with the duster. Then I have my annual book cull. The one where I ruthlessly get rid of books that I enjoyed but will never read again, those I didn't enjoy and those that I started, never finished and am no longer kidding myself that I ever will. They all get put in the boot of the car ready for the charity shop. Then I pulled the bookcase away from the wall. I tell myself that it's so I can clean underneath and behind it. But we all know that it's really so that I can move it somewhere else. I want to put the bookcase against the wall next to the dining table. The very same place that our old bookcase stood in fact, before I decided that I wanted to move that one. Actually before I decided that that particular bookcase (some rough cubes storage units from B&Q) should be replaced with a bit of IKEA Billy. I think that the dresser will look nicer here, instead of over there, and the bookcase will look nicer over there instead of here. It's time the room had a re-fresh. It will make a nice change. But there's a problem, and it's only as I heave the bookcase away from the wall that I remember Marc having to remove the skirting board in order to fit the sodding bookcase here in the first place. Aaah yes, it's all come flooding back. So I can't move it anyway. It will just have to stay put. Bugger. I go and make a cup of tea, and sit down on the sofa. I put my feet up on top of a pile of books. It occurs to me that I could probably leave all my books right where they are, and no-one would notice anyway. Olly would turn them into hide outs or secret bases for his LEGO. Sam and Alfie only come down to eat, shower and moan, so they wouldn't care. And Marc would probably use them as a make-shift coffee table. But I do eventually put all the books back. They are ordered by author, with two miscellaneous shelves. A His (camper van stuff and fishing) and a Hers (current gardening reference reads, craft books, note pads) and children's books that Olly is still too young for, which includes the seminal work 'Go The F*^k To Sleep' I find a book mark that Mum bought for me when she visited Howarth House in the 80s. I thought I'd lost it years ago, and I happily slip it inside my current read. I re-acquaint myself with old friends, and chuckle at some of the notes in the margin made by my sixteen year old self. I realise too that several of my Bill Brysons are missing, and so I go retrieve them from Sam's own over-crowded bookcase. With all of that de-cluttering there is space for a bit of frou frou. So I put some pottery that has been languishing in the utility room, getting on the cat's nerves (he likes to doze on the window sill and it gets in his way). When I have finally finished, I stand back and look. My bookcase looks a bit odd. A bit too tidy and organised. You know that feeling when you've had your hair cut, and your face looks different? It takes a couple of days to get used to the new you. Those subtle changes that even just a trim of the fringe can create. Well it's a bit like that. I have to admit that the bookcase looks fine where it is. It's tucked away into the 'awkward' space of the room. It fills and fits the space perfectly. Perhaps it can stay there after all. Do you share my love of moving rooms around? Do you faff and frou frou? By the way, there were 37 marbles, one Christmas biscuit from two years ago, 100s of assorted pieces of Lego, one dinosaur (plastic), what I think is a shriveled grape, 37 pence, a lot of pet hair, an empty juice carton, a toast crust and some nail clippers under that bloody bookcase. I'm just the same. Life would be boring otherwise. The sitting room floor is currently home to about 20 piles of magazines, ex bookshelves. Himself is distinctly unimpressed. I want to flick through them before they go down the dump, just in case there's anything important in there. But where's the time? Doh. I loved your terrifying list of Things Found Under Shelves. I have had a few of those sorts of lists myself, usually when moving house and family/friends gaze at the debris right along with me. Things that humble us are good for us right? Gee, I sure hope so. I never move furniture around, my house is so small that there's nowhere to move it to, everything's shoehorned in to it's place and it wouldn't fit anywhere else. I do like to have a spring clean though and I can be pretty ruthless when it comes to getting rid of stuff. 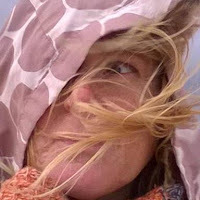 A great blog, it made me laugh, smile and sympathise :) I am not a furniture mover, once I have something the way I like it, it stays, but I did identify with all the "stuff" you found underneath, the joy of a house with kids. Bizarrely I also have that bookmark, bought when I visited Howarth with my parents in the late 70's or early 80's. When we get our own house again, I want bog bookshelves like that, we'll need several for all our books, but I love seing them all on display with bits and pieces tucked in between. Hmm - your list of Things Found Under the Bookshelves is remarkably similar to my frequent lists of Things Found Under the Sofa - always loads of Lego and desiccated food - but usually numerous (odd and dirty) socks too. Your boys must be much better trained in sock management than mine! I get this. I really do. And remember you have a house of boys. Add a girl in and you would have pens, hair bands and at least one receipt from Lush under there as well! Nice to meet you. I came over from Run Craft Read Cook blog. I couldn't resist the title of the post! I do this too, you're not alone, the pull it out and spread it about cull that is, not the bookcase moving. Our bookcases are on the two landings (that sounds like I live in a rather grand house and I really don't, plus I hate hoovering stairs and we have so bloody many of them) ... we tried books in the living room but the dogs kept nibbling the corners of the big ones on the bottom shelf! Moving things around isn't something I do too much of these days; our current house is rented (hopefully we'll be back in our own place very soon) and there's just not that much inclination. This surprises me as I'm very into interiors and styling. I'm a serial faffer. Arranging and rearranging - now that makes me happy. Small things, like books and pottery and pictures. I dread to think what we'll find when we shift all the furniture from here. Although money would be great. Morning Leanne, Early start for me today but couldn't get going until I'd popped in to see what you've been up to. I love this story of the bookshelf shuffle. When we lived in the big house we constantly moved things around. Now we're in the cottage D gets the itch to move things but unfortunately we are a little short on space now so he moves it all around and when finished it's back to exactly where it was before. I don't tell him though he thinks it's a job well done.... Funny what you find when you're not actually looking for it. Actually, what caught my eye is the lovely little table next to the bookcase, and the ledge on the other side! Our house is one big bookcase, Leanne! Thousands of books here, and don't mention the magazines ... thousands of those, too. Far too many. I need to weed. My last book weed produced more than 240 books for the charity shops.